Today, August 4th 2018, is the three-year anniversary of Foodie Stories by Anders Husa. Right now, I’m on my way to an interview with CBS News Travel Editor Peter Greenberg on his Peter Greenberg Worldwide radio show. I’ll probably tell him the story about how it all started, which was actually closer to 10 years ago. A story I’ve told many journalists before, including this recent interview with CultureTrip. In 2016, when celebrating my first year on a new platform, I explained what kind of a blog this is supposed to be, and touched upon subjects like my philosophy and vision for the brand Foodie Stories by Anders Husa. I still stand by those ideas and I feel that I’ve come a long way towards my goals. Later the same year, and in early 2017, I won two awards for my food blog. One of them was Food Blog of the Year in Norway, which prompted me to share some thoughts about the future. In particular, how I needed to turn the hobby into a business in order to be able to continue. I’m happy to say, one and a half year later, that business is booming, and I feel like I’ve done it in a way that works both for me, my readers, and my customers. My channels have grown to much larger numbers, with more than 30K followers on Instagram and almost the same on my Facebook page. Recently, I launched my YouTube-channel, which quickly has grown to 6K subscribers. Numbers alone are not important, though. It’s the engagement from you guys – my readers, viewers, and followers – that matter. These are some of my most engaging posts since I started. I started this project to inspire others to eat better food, and that is what I intend to do in the future as well. Know that I read and reply to every question I get, whether in the form of an e-mail, private message, or comment. Keep asking me, leaving comments, and giving me feedback, and I’ll do my best to help you out. Over the years, I’ve had some amazing meals. Some of my most popular posts, every December, are my top lists of best dishes in the year that passed. A tradition I started in 2015, continued in 2016, and made sure to honor in 2017 as well. Another topic that clearly interests you a lot, are my Michelin Guide-predictions. The 2017 guesswork got 20.000 curious clicks, while my 2018 crystal ball hit a new record with close to 30.000. Luckily, I also pinned some of the stars correctly. 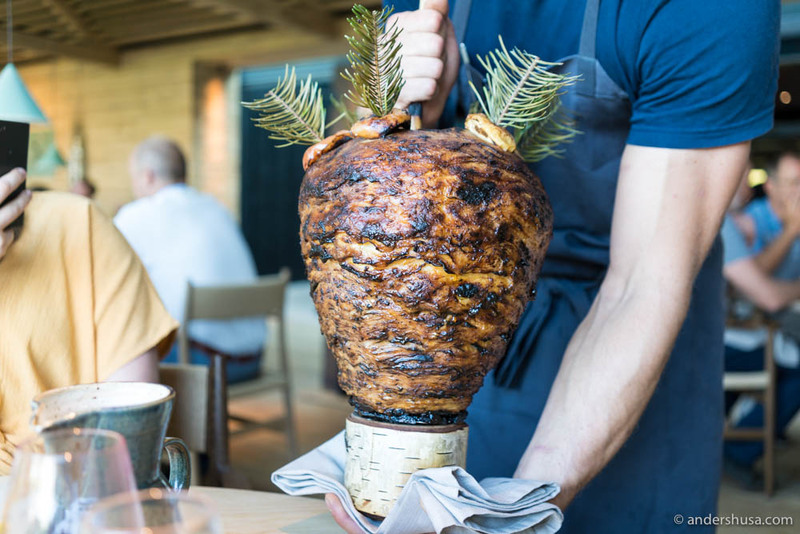 With this in mind, considering the appeal of lists and Michelin-stars, I figured I would share with you my top three meals in Scandinavia – ever. All of these restaurants have been richly rewarded by the red guide as well. However, I’m not going to rate them against each other. That is just impossible and makes no sense. All three are equally good in their own way, with strengths and weaknesses. And for now, I think I’ll save the international top list for my five-year anniversary. 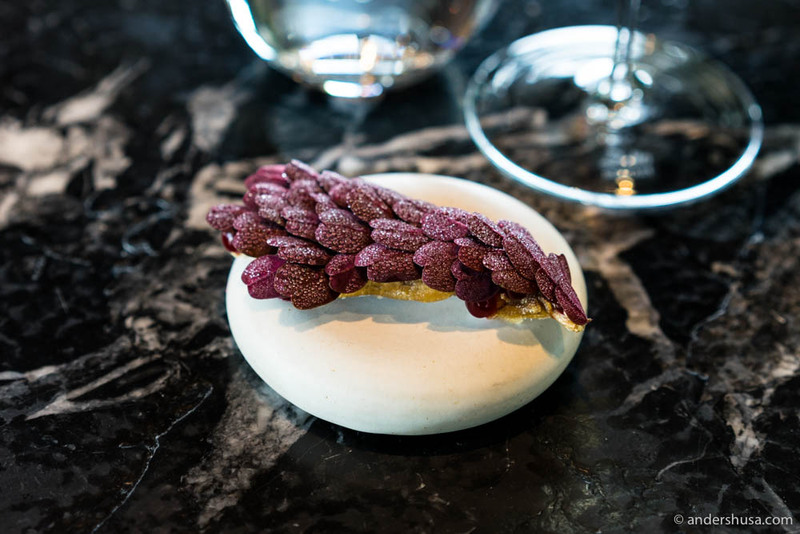 I’ve been to the three-Michelin-starred restaurant Geranium in Copenhagen five times, but I still remember the first visit as the most mind-blowing. My last meal, in April this year, was probably better in every way, but there is something about that first visit to Geranium that is just extra special to me. Everything was so perfect. The room, the view, the people, the well-choreographed dance of the waiters, the food presentations, and the flavors. I was mind-blown and felt like I was floating on a pink marshmallow cloud in foodie heaven. At the time, Geranium only had two Michelin-stars, was no. 51 on the World’s 50 Best-list, and wasn’t talked about all that much. Today, they have added a star and climbed to no. 19 on the list, first in 2017 and later repeated in 2018. This year, they were also awarded the Art of Hospitality Award. So incredibly well-deserved! Of all the restaurants I’ve visited in Scandinavia, and probably the world, there is none that has a higher level of consistency in their food and service than Geranium. 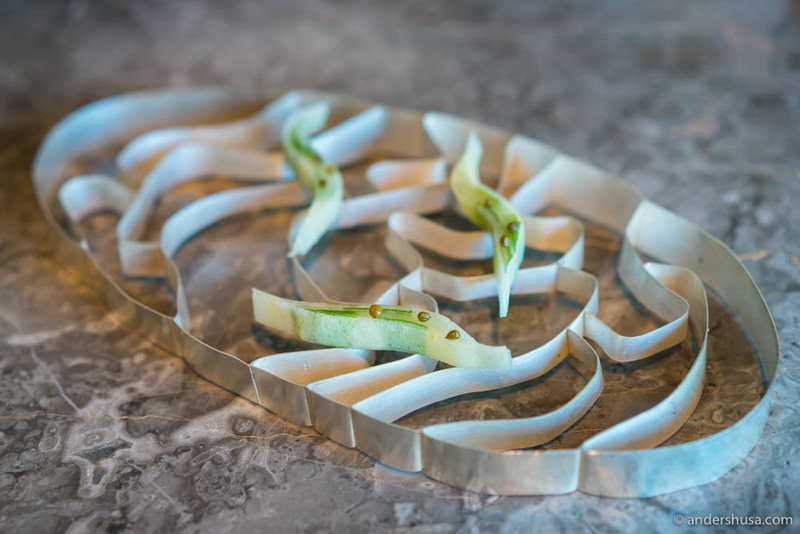 Read about my first visit to Geranium in 2015 here. Read about my third visit to Geranium in 2016 here. Read about my fourth visit to Geranium in 2016 here. 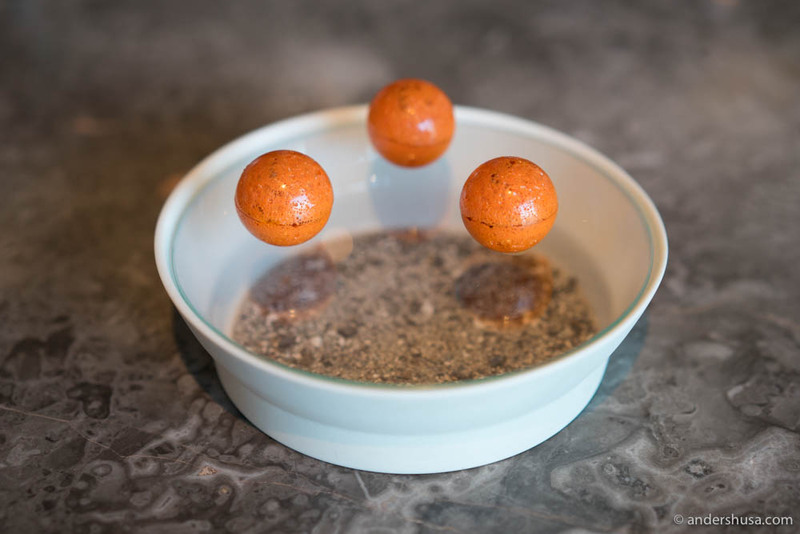 Floating spheres of sea buckthorn! Mind-blowing is also the word I used to describe my last meal at Noma during the vegetable season. Counting all visits, including the various pop-ups, I’ve actually been to Noma twelve times over the years and I even have two more bookings before this year is over. Maybe that’s why Noma feels like an extended family to me, but, to be honest, it has felt like that as far back as my second visit in 2015. The moment you step inside their door, you are always greeted by the Noma welcome. Instantly, you lower your guard and relax. Personal service and incomparable creativity are the key characteristics of this Copenhagen restaurant. I’ve consistently described Noma as the most influential restaurant in the world, and I think that stands even today, eight years after their first no. 1 spot on the World’s 50 Best-list. Currently, the pride of Denmark is both starless and without any ranks, since they closed down and moved last year. However, I think their comeback will be strong and brutal. Read about my second visit to Noma in 2015. Read about my fourth visit to Noma in 2016. Read about my sixth visit to Noma in 2018. 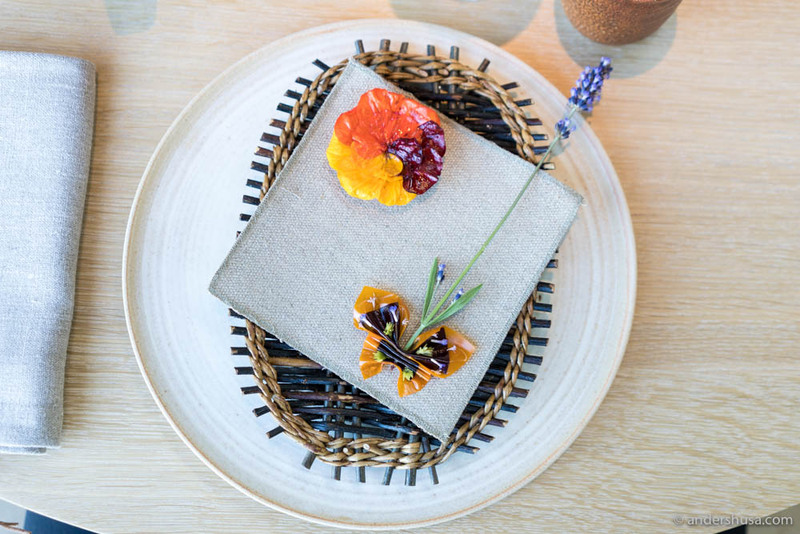 Read about my ninth visit to Noma in 2018.
Who even thinks about making food as pretty as this? Maaemo has a special place in my heart. Without a trace of doubt, the best restaurant in Norway, and now also the 35th best restaurant in the world. In my book, however, they should be in the top five of the World’s 50 Best-list. 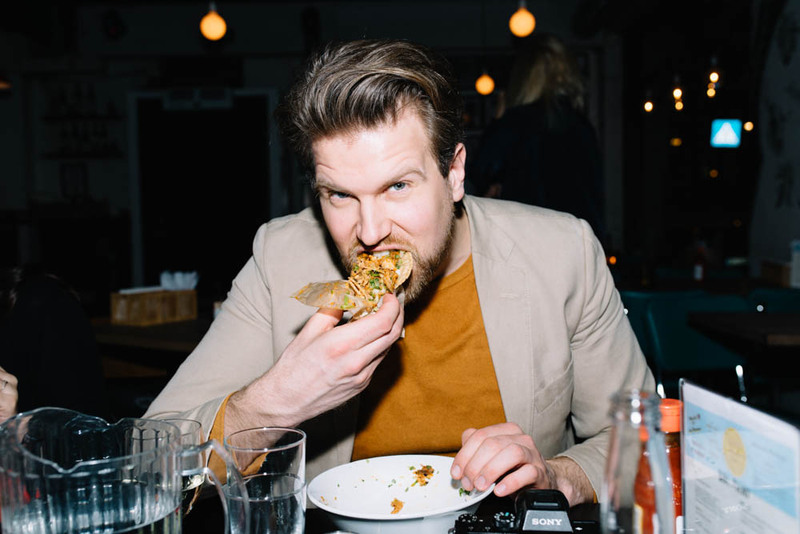 It took a Danish chef, Esben Holmboe Bang, to re-invent all the food traditions and discover the true flavors of Norway. Old cooking techniques are seen through a modern looking-glass. Forgotten ingredients and flavors, diluted and presented in a brand new way. I’ve called Maaemo the pride of Norway, and that feeling has been enhanced for every visit. I rarely feel like a patriot, except, perhaps, when I brag to others about Maaemo. Recently, I ate my 10th meal at this three-Michelin-starred restaurant, but five of those visits were last year alone. Thinking back, my sixth and eight visits were probably the absolute highlights. Maaemo for me is about pungency in flavors, while at the same time always highlighting the main ingredient, no matter how delicate. 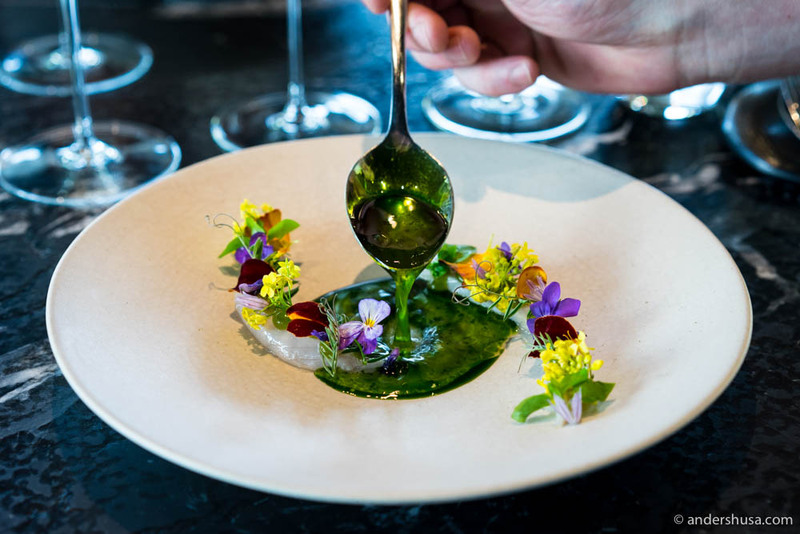 Maaemo dishes are first and foremost delicious, and secondly pretty to look at, but usually nails both. A meal here is never boring, and you’re always in the best of hands. I can’t wait for my 11th visit. Maaemo is the pride of Norway! Keep the good work on inspiring others to eat better food! It is still surprising me that you’re ? ?, but not from DK/NO with much richer food culture, but keep the good work cause ?? need your help in discovering & opening to the ? ? ? Thanks for the kind words ? Hi Isabel, thanks for the very kind words! Happy to hear that. Thank you for sharing – inspiration on your blog, meals to remember and places to return to!! I would personally love if you would share some more videos! And perhaps also if there were longer – you a great at encapsuling the atmosphere and the beauty of the food!! Thank you so much for your hunger creating videos. Please do not stop. but i;am struggling a little bitt between Statholdergaarden and A Laise. Witch one do you prefer? Hi Martin. Thanks for the kind words. My preference would be À L’aise.